When planning your Spring garden, make sure you keep your sensitive skin needs in mind. As you clean the flower beds, remove old leaves, and clear the base of the plants to encourage new growth, start calculating which new plants, herbs, and vegetables to add. While pruning all the dry parts of your plants with your gardening shears, consider where to plant some highly versatile rosemary. Rosemary is not just amazing as a touch of flavor to roasted potatoes, but it also boasts outstanding properties in treating sensitive skin, when used in its essential oil form. Don’t forget to make space for the Calendula and Verbena plants, as well! Historically used by the Egyptians, Greeks and Romans, the antibacterial properties of rosemary were effective in combating impurities and the excessive production of sebum in case of acne. In case of oily skin, rosemary essential oil can be used pure, simply by pouring a few drops on a sterile gauze and dabbing the areas affected by the pimples. One of the uses of rosemary essential oil is for sensitive skin, as it is rich in antioxidants. Rosemary essential oil is also effective against water retention and cellulite, especially when used together with other essential oils, such as lemon. A rustic and undemanding plant, Rosemary is one of the most important and well known medicinal herbs. Widespread today in all the countries with a temperate climate, where it is found both cultivated and spontaneous, it is one of the easiest aromatic plants to cultivate. Highly adaptable, rosemary grows in various types of soil and demonstrates a good resistance to low temperatures. Renowned and widely used in the kitchen, both fresh and dried, it is able to provide an essential oil with innumerable beneficial properties, both for the mind and for the body. This small yellow-orange flower, grows in sunny environments and provides significant benefits for the skin. Having the ability to filter UV rays, its flower in often used in sunscreens. Moreover, thanks to the presence of flavonoids, the calendula flower is an excellent antioxidant, a powerful anti-inflammatory and a perfect product to stimulate cell regeneration. This flower is planted in April. It is not difficult to germinate this plant, if you put in the flowerbeds, it will grow spontaneously and continue to grow from one year to another. Ideal terrain. 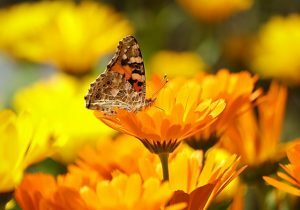 Plant calendula in fairly loose soil, because it is damaged by water stagnation. Make sure you water it regularly, but do not use large quantities of water. Cultivated as a medicinal or aromatic plant, verbena is often used in creams and lotions. It has tonic, refreshing, and emollient properties. Verbena is particularly appreciated by people with combination or sensitive skin thanks to its soothing properties. It must be applied externally to the skin. Verbenas need a position in total sunlight, and the earth must always be moderately damp, but without water stagnation. To have lush, beautiful and healthy verbenas, you must care for them during the summer by abundantly watering the plants, preferably late in the evening. In case you use potted plants, check the soil, remembering that it must always be moist but never soaked.